27 June 2004: The 2003 great apparition has come to an end. 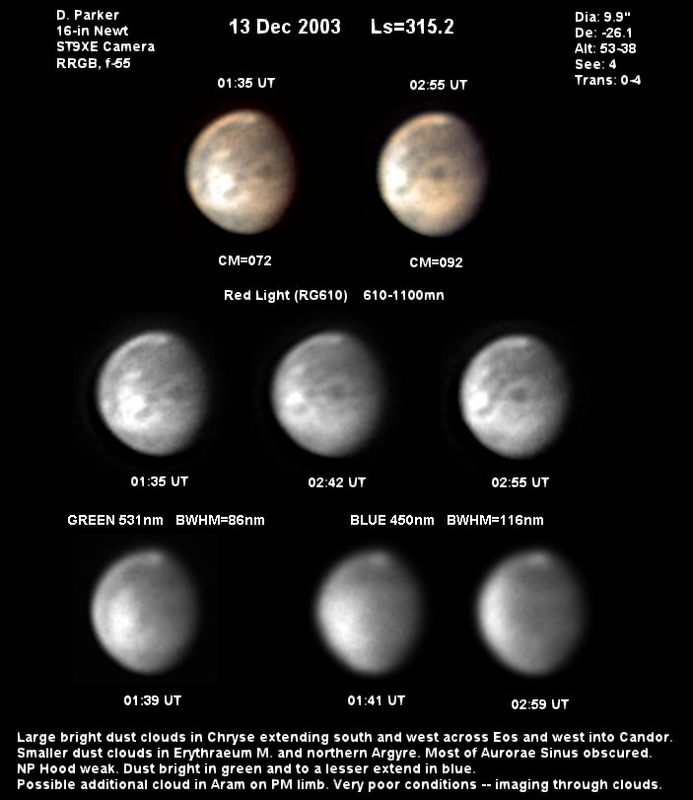 Yukio MORITA (Mo) at Hiroshima tried to shoot the twilight Mars on 13 June (λ=047°Ls), but could not produce any good image. So his images made on 5 June 2004 (λ=043°Ls, δ=3.9 arcsecs) at ω=290°W must be the final (see Gallery). Masatsugu MINAMI (Mn) at Fukui made his final observation on 4 June 2004 (λ=043°Ls) at 9:50 GMT. Found the planet in the bright sky at 18:35 JST, while Syrtis Mj and the white npc were caught only for ten minutes around 18:50 JST, and became blurred as it went down to the west. The observation of Mn was numbered 1158. The first observation made by Mn was on 25 October 2002 (λ=086°Ls, δ=3.7 arcsecs). This window shall be closed on 1 July. 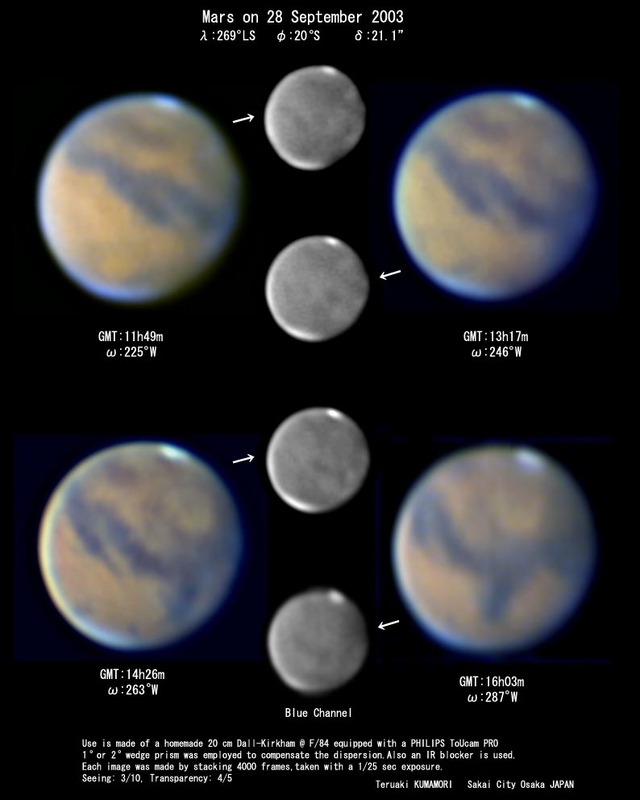 15 May 2004: The Martian season reached λ=033°Ls, and as far as MINAMI observed on 14 May, the disk still showed a definite outline and the npc was visible, while the planet was much declined to the west. In Denmark, even at 21:30 local daylight saving time, as we heard, it was far too light for E SIEGEL to be able to see Mars with her naked eye on 28 April, and so her observation on 16 April (λ=020°Ls) at ω=194°W rounded off her long-standing work in the 2003 great apparition. She used 330x 20cm SCT. Otherwise she made two more observations in April on 10 April (λ=017°Ls) and 14 April. 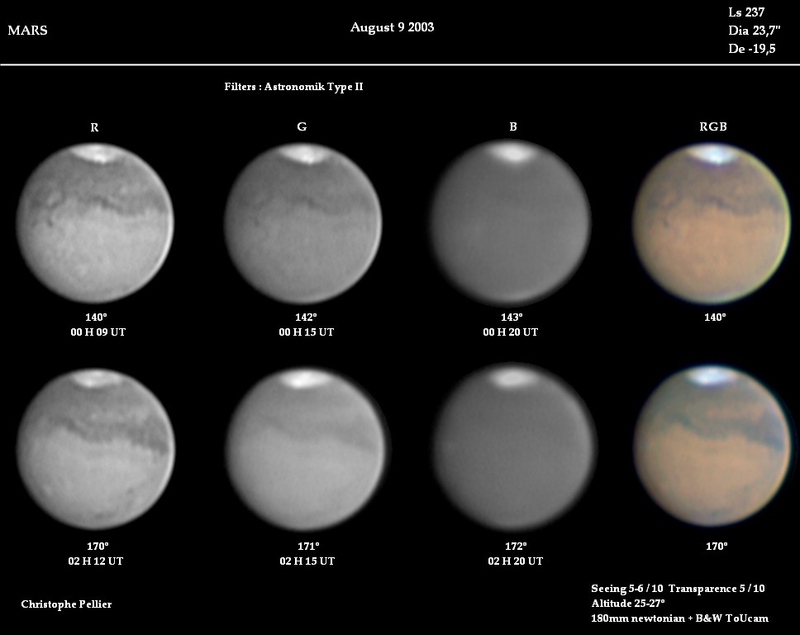 The TES shows that the atmosphere of the planet is quite clear at present; The Martian season corresponds to the one at the end of June 2002. See the MGS images. 5 April 2004 (λ=015°Ls): Elisabeth SIEGEL reported 5 drawings made in March 2004 from 3 March (λ=359°Ls, δ=5.6") to 29 March (λ=011°Ls, δ=4.9") by the use of a 20 cm SCT at Malling, Denmark. 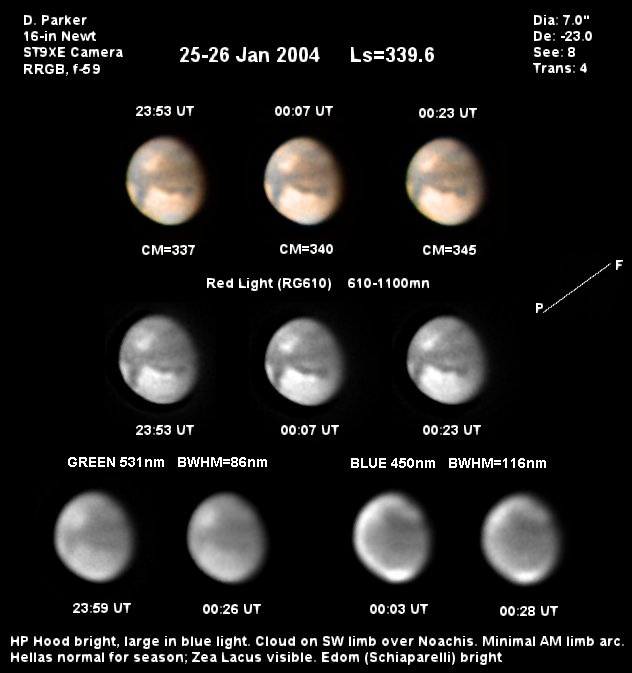 28 March 2004 (λ=012°Ls) : The angular diameter δ of Mars has fallen below 5 arcsecs, while the planet is still observable from 16 hrs JST (7 GMT) near the zenith down to 20 hrs JST (11 GMT) if the atmospheric condition is good. The dark markings and the npc/nph are clearly visible. Today the total number of MINAMI's drawings this apparition amounted to 1, 140 (Mn started from 25 October 2002 (λ=086°Ls) when δ=3.7"). 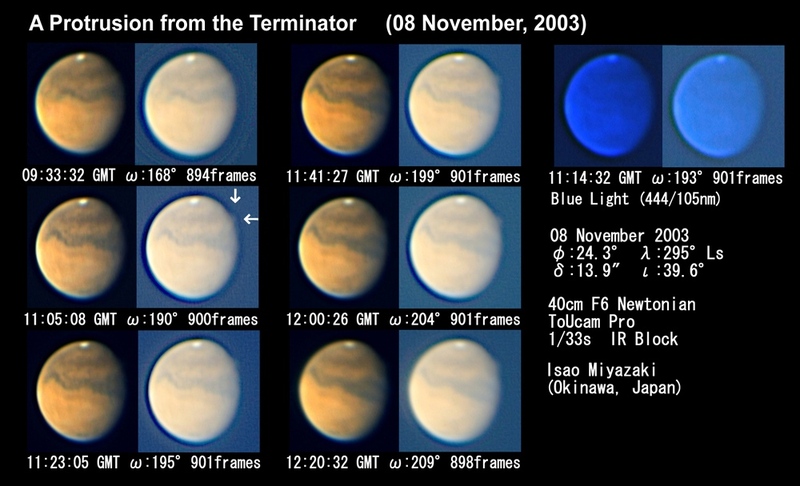 7 March 2004 (λ=001°Ls) : Visual season is not over yet! Elisabeth SIEGEL (Denmark) reported 6 visual observations made in February (9 Feb (λ=347°Ls) to 19 Feb (λ=357°Ls)). T IWASAKI, M MURAKAMI and M MINAMI also took 22, 8 and 17 drawings respectively during one month from 16 January (λ=334°Ls) to 15 February (λ=350°Ls). As to the ccd observations, see the CMO Gallery. 1 March 2004 (λ=357°Ls) : William SHEEHAN writes "Dear Masatsugu, I'm sure you've been following the exciting news regarding Opportunity, the rover that landed at Meridiani Planum? Apparently NASA is planning a press conference tomorrow in which they're going to announce the existence of brine on the surface, which is why the rover's wheels tracks look like they're formed in mud. That's exhilarating to me personally since, when we observed those specular reflections from Edom Prom (which is in this area) back in June2001, we thought maybe the reflections were off ice deposits or salt pans (we suspected the latter). .....Perhaps I can discuss the water on Mars question -- and specular reflections -- at one of our meetings in six weeks. Yours, Bill "
14 February 2004 (λ=350°Ls) : We are in great need of clearer B images at this season. Since around λ=340°Ls, there must have been arisen several pieces of white patches at the south circumpolar region. Unfortunately at the rear side of the Japan islands the weather at present continues still snowy/dismal, while on 31 January (λ=343°Ls) a hazy pall was witnessed here from the side of Solis L. On 10 February, Hellas and its south were seen showing an aspect alike to the peculiar one observed in December 1990 (λ=243°Ls - 347°Ls from Japan. CMO #108 (1991) p933). 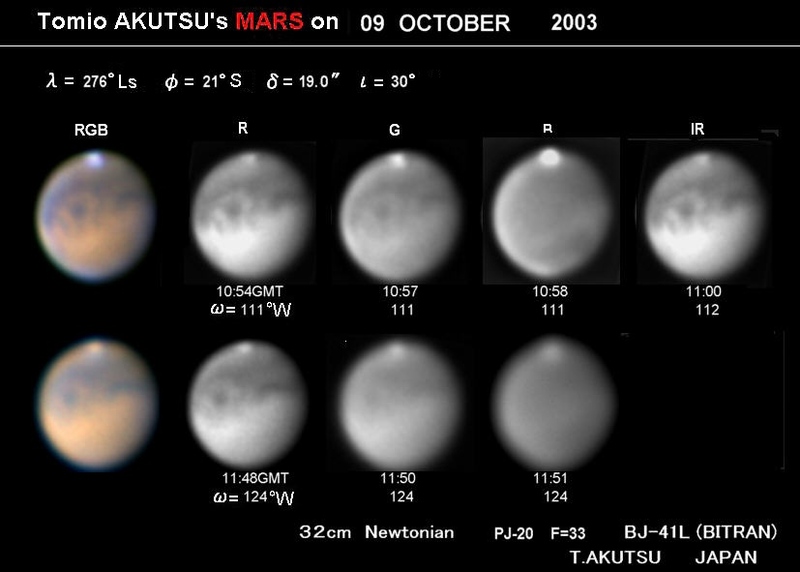 See here KUMAMORI's images on 11 February 2004 (λ=348°Ls) as well as PARKER's ones on 26 January 2004 (λ=340°Ls). 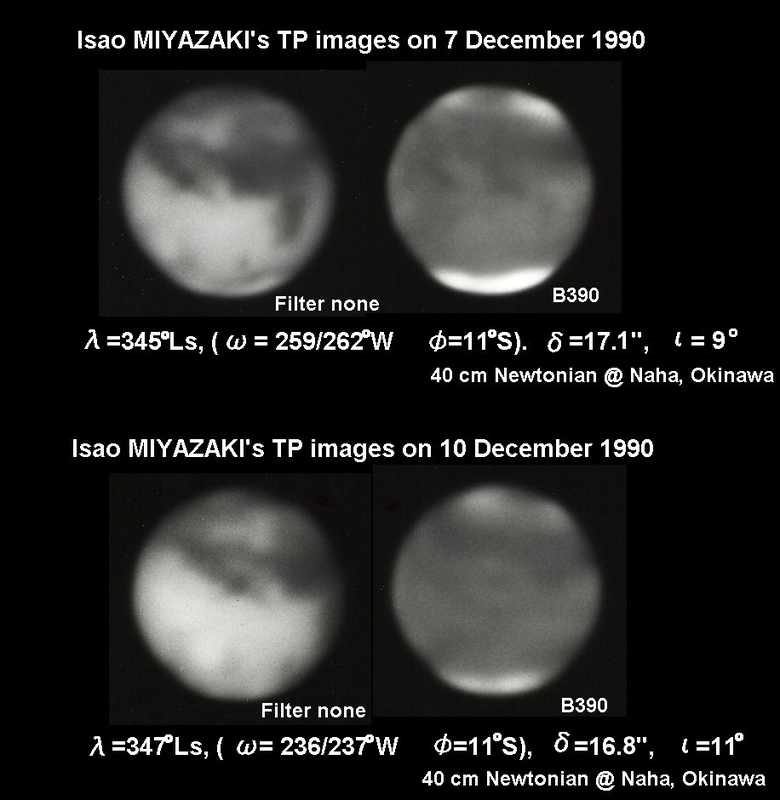 As to the white patches observed at the spr in 1990, refer here to MIYAZAKI's B390/TP images on 7 December 1990 (λ=345°Ls) and 10 December 1990 (λ=347°Ls) as well as AKUTSU's images on 13 December 1990 (λ=348°Ls). 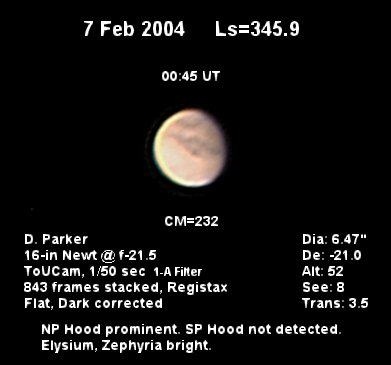 PARKER's image on 7 February 2004 (λ=346°Ls at ω=232°W) is comparable with MIYAZAKI's ones on 10 December 1990 (at ω=236°W). 25 January 2004 (λ=339°Ls) : NASA reports: Spirit's twin, Opportunity has landed safely on Mars as scheduled today GMT. 22 January 2004 at 18:35 GMT (λ=338°Ls) : NASA announced: Spirit has not returned any data since 21 January. 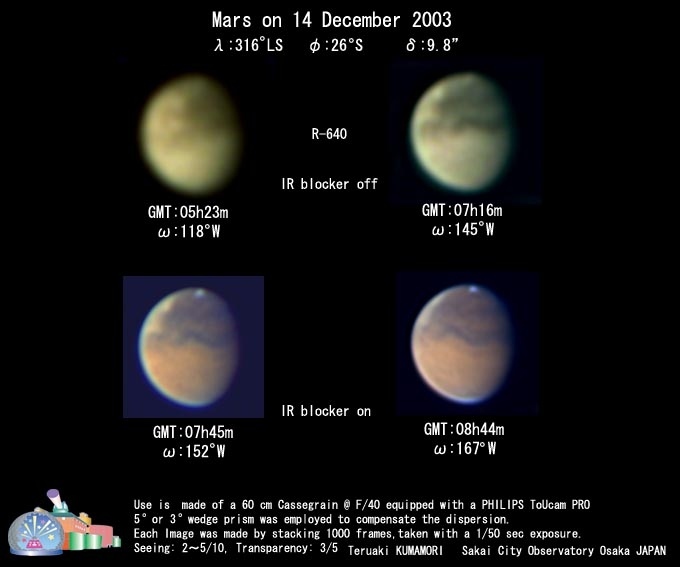 14 January 2004 (λ=333°Ls) : Mars Express took Europe's first close-up colour picture of Agathodaemon on 14 January. 4 January 2004 (λ=328°Ls) : We hear that US Rover Spirit parachuted on to the Mars surface at 04:35 GMT as scheduled on 4 January. The Rover survived and sent back to US a signal shortly after touchdown (the Airbag fabric is woven of Japanese made fibres). 25 December 2003 (λ=322°Ls) : BBC News reports that Beagle 2, heading for Isidis Planitia, should have landed at 02:54 GMT, but seems still to be spending a silent night. Mars Odyssey was expected to pick up the call sign three hrs later, but in vain. The Jodrell Bank Telescope will next try to listen to Beagle 2 near at mid-night GMT. 19 December 2003 (λ=319°Ls) : BBC News reports that Beagle 2 successfuly has separated to glide solo towards Mars. The separation was confirmed just after 11:10 GMT. 16 December 2003 (λ=317°Ls) : Ch PELLIER reported he detected a bright orange dust disturbance jumped to the south of S Sabaeus in Deucalionis R, that was not present the day before (reported at 20:15 GMT). 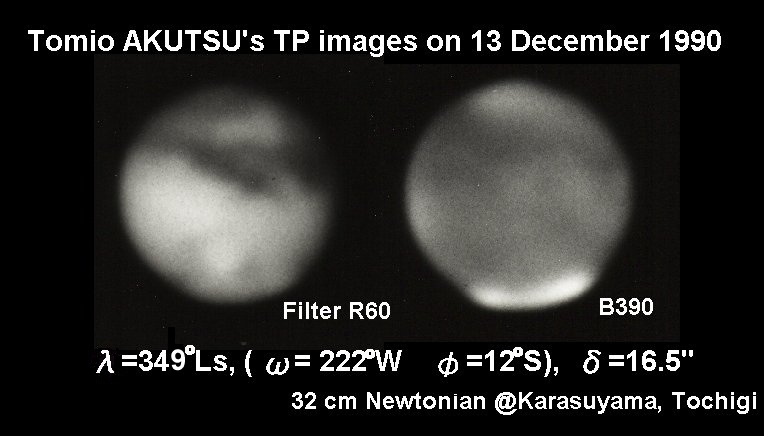 14 December 2003 (λ=316°Ls) at 19:00 GMT : Teruaki KUMAMORI has finished his processing of the images from ω=118°W (5:28 GMT=14:28 JST) to ω=167°W taken by a 60 cm Cass. 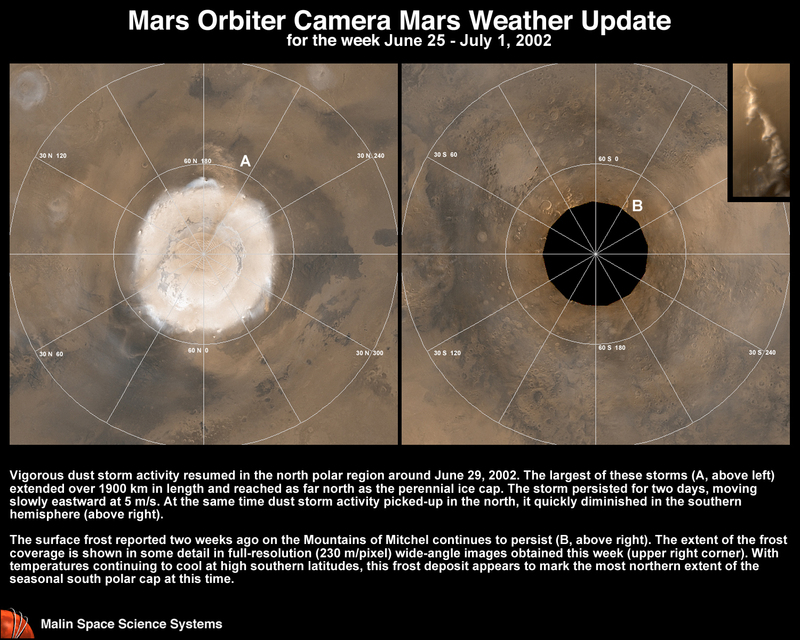 A subsequent dust rise is seen near Claritas, while the higher latitude one to the ES of Aonius S looks the brightest. 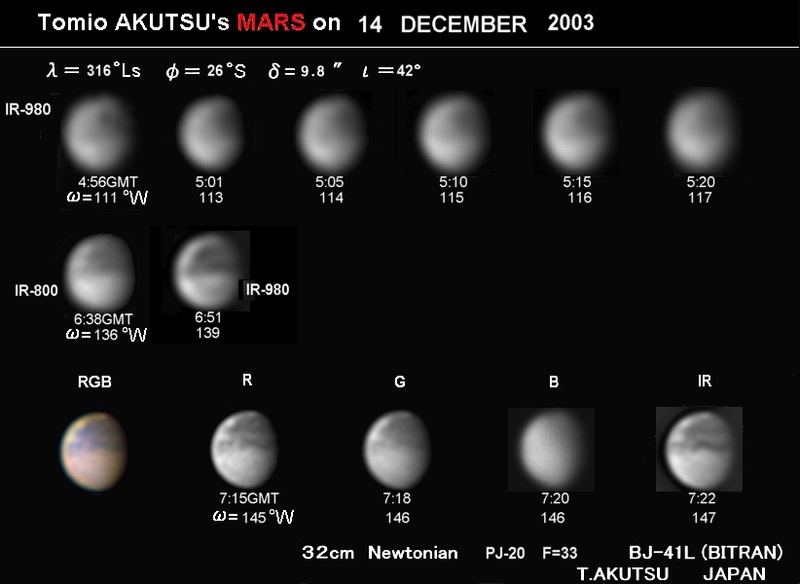 14 December 2003 (λ=316°Ls) at 12:00 GMT : Tomio AKUTSU started today from 5 hrs GMT, 2.5 hrs before the sundown, and observed that the dust cloud found by Don PARKER yesterday had made a dust leap to Thaumasia Phoelix and furthermore to the higher latitude area near Dia. 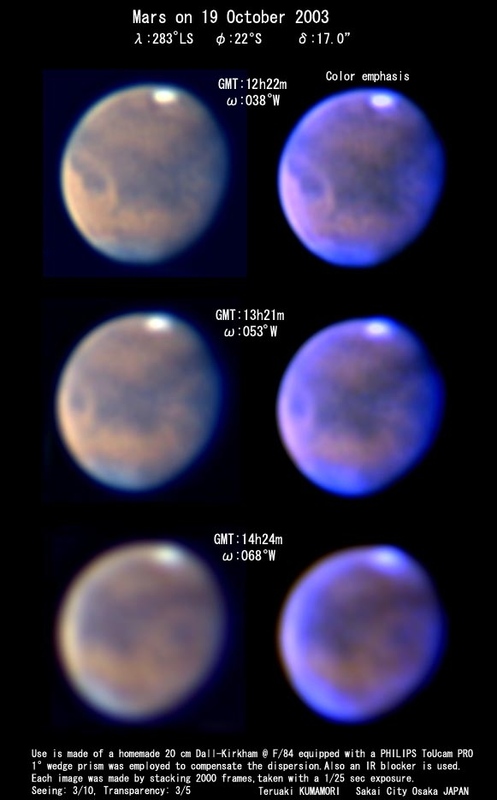 Tharsis is also limb bright in IR. Phasis looks still visible as well as a remnant of Solis L.
13 December 2003 (λ=315°Ls) : Don PARKER detected a significant dust cloud at ω=072°W covering a large area (similar to the case we saw around on 1 August 2003(λ=233°Ls)) from a southern Chryse upto Mare Erythraeum. The northern Argyre shows another branch. Margaritifer Sinus is still visible, but Don suggests the preceding Aram may be also dusty. Aurorae Sinus to its south shows still darkened patches while the area also looks deformed. Otherwise the following region including Solis L is not yet affected. We hope however all are on the alert for the possible resonant leaps of dust. 2 December 2003 (λ=309°Ls) : Elisabeth SIEGEL reported that the summit of Elysium Mons had shown up as a tiny, circular, really conspicuous bright spot in W47 on the morning side quite close to the terminator on 19 November (λ=302°Ls). Similarly she also noticed another bright spot which just coincided with the summit of Ascraeus Mons near the morning terminator on 28 November (λ=307°Ls). Further attentive observations should be requested. 20 November 2003 (λ=302°Ls) : TSUNEMACHI informed us that the previously active AR#0486 and AR#0488 have came back on the Mars-facing side of the Sun as newly AR#0507 and AR#0508 respectively. Preceding AR#0501 (previously AR#0484) is already active. 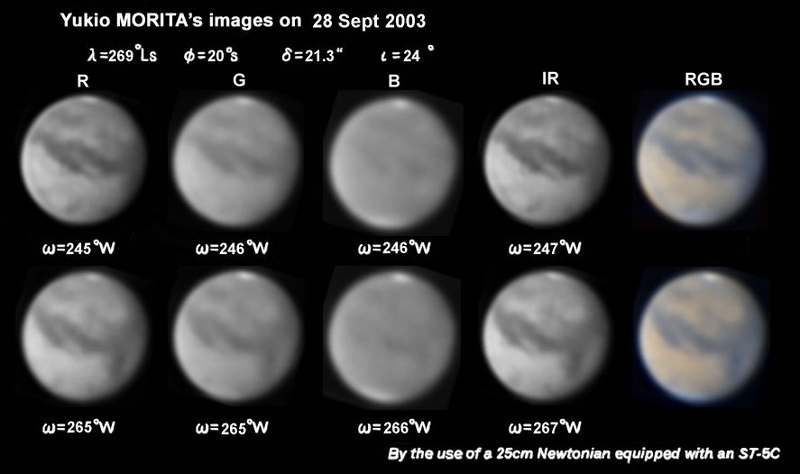 8 November 2003 (λ=295°Ls) : A prominent protrusion from the terminator is visible: On 4 November at the session of ω=203°W, MINAMI was visually aware of a light protrusion at the morning terminator around the lat 40 - 50°S, and again on 7 November at ω=203°W, he noticed the same protrusion. It was explicit until around ω=220°W. During the session, MINAMI communicated with MIYAZAKI on mobile, while it was cloudy at Okinawa. Isao MIYAZAKI however confirmed visually the phenomenon on the following day. It was not seen before 10h GMT on 8 November at ω=170°W yet, but very explicit at 11h GMT (ω=188°W) and visible until ω=215°W when it became cloudy. See the CMO Gallery for MIYAZAKI's ToUcam images. The blue image does not show any prominent cloud. The auroral matter looks to cover the higher skies of the area from 260°W to 285°W (so the west of Ausonia to the eastern Hellas across M Hardiacum). Further observations are welcome. Note Added : The mega flare on 4 November has been revised by NOAA to be an X28, doing away with SEC's X17.4. The associated proton event showed its peak on 5 November at 6h GMT. 22 October 2003 (λ=284ﾟLs) : 1) Noachis and Deucalionis R came into sight around from 15 October (λ=280ﾟLs). There has been no new dust disturbance as yet and Noachis looks rather shadowy. Hellas remains as before and shows still a habitual bright core at the NW corner. M Australe has been slightly darkened in a wine colour (as well as Depressiones Hellesponticae again) similarly to the case of M Chronium (reported on 13 October). 2) Distribution of airborne-dusts/water-condensates has now turned out to be not uniform, and their de-concentrations make some markings look darker than the dusty surroundings. Visually these holes were easily found near the morning terminator, while some ccd images show other examples of holes more inside (for example see KUMAMORI's images on 17 and 19 October or Van der VELDEN's images on 19 October). 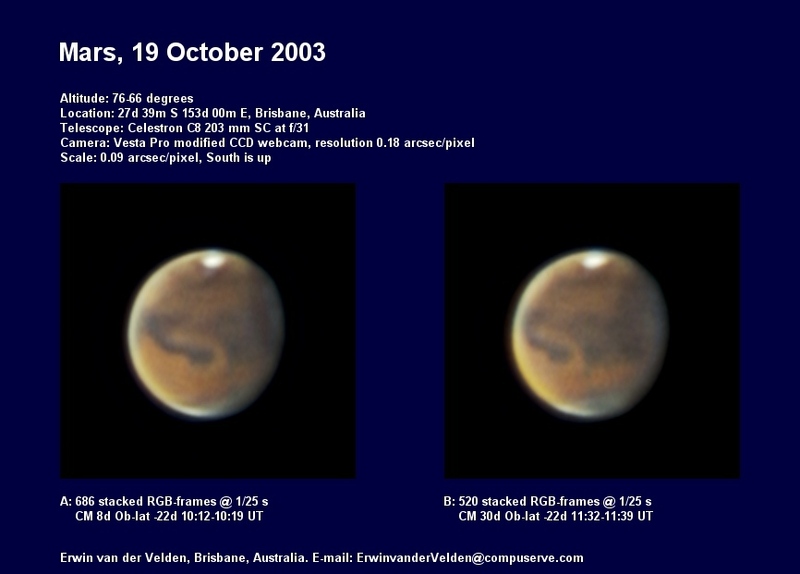 14 October 2003 (λ=280ﾟLs) bis : 1) A similar dust concentration (pointed out by M VALIMBERTI at Argyre to Dia this night) was visible also at an area from the west of Hellas down to Trinacria (Ausonia Borealis) on 26, ~ 28 September (λ=268ﾟLs~269ﾟLs). See KUMAMORI's images made on 26 Sept at ω=259ﾟW and on 28 Sept at ω=263ﾟW, VALIMBERTI's image on 27 Sept at ω=241ﾟW, and MORITA's image on 28 Sept at ω=268ﾟW. This vague concentration of dust was watched visually by MINAMI on 26, 26, and 27 September around ω=250ﾟW~280ﾟW: The area looked dusty or sandy, but not bright, not glossy. Rather Eridania and Ausonia Australis as well as the NW corner of Hellas were much brighter; the former being rather ground lit while the latter being a storm in a tea cup. The preceding Thyle II looked also sandy, but became yellow-whitish as it approached the limb side. Note that once this kind of concentration occurs, the colour of the dark markings around it turns to have a higher colour (wine or chocolate colour). 2) Since then this dust configuration at Trinacria seems to remain not so changed and at least has not so expanded. Tom DOBBINS recently reported about a "localized brightening in Hellas with apparent cloud cutting across Mare Hadriacum near Euripus into Ausonia" (13 October at 3:49 GMT). His images made on 13 and 14 October (λ=279ﾟLs) respectively at ω=295ﾟW and ω=286ﾟW are claimed to show it. 14 October 2003 (λ=280ﾟLs) at 15:30 GMT : Maurice VALIMBERTI (MVl) emailed to us pointing out that on 13 and 14 October (λ=279ﾟLs) a dust concentration vaguely occurred over a large area from Argyre to Dia. 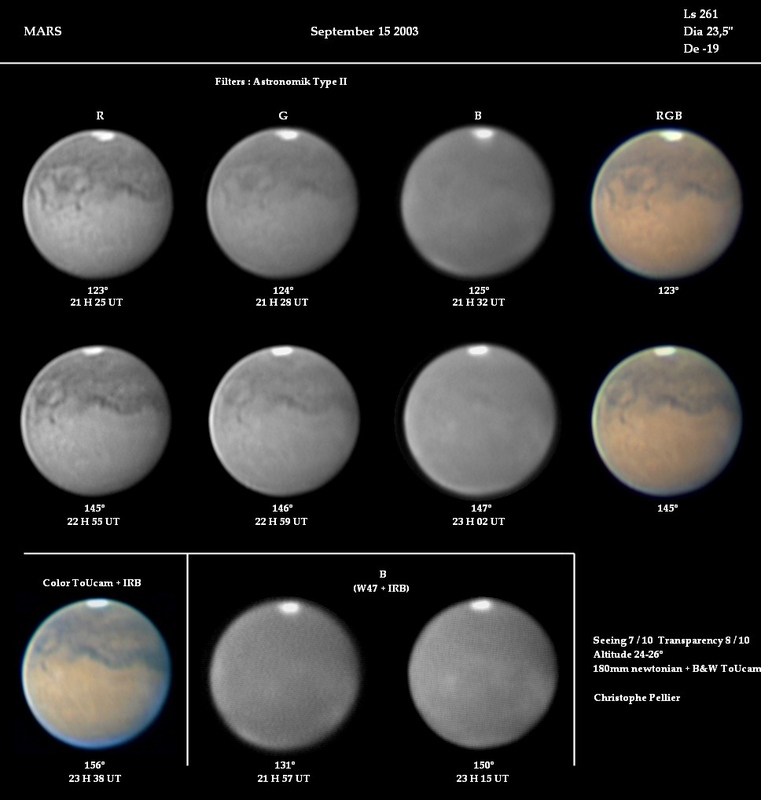 See MVl's images on 13 October at ω=057ﾟW and on 14 October at ω=050ﾟW (09:56 GMT). This concentration of dust was already visible on 12 October (λ=278ﾟLs) but rather faint as visually observed by M MINAMI on 12 October at ω=053ﾟW & 063ﾟW. The area became yellow-whitish as it approached the evening limb. 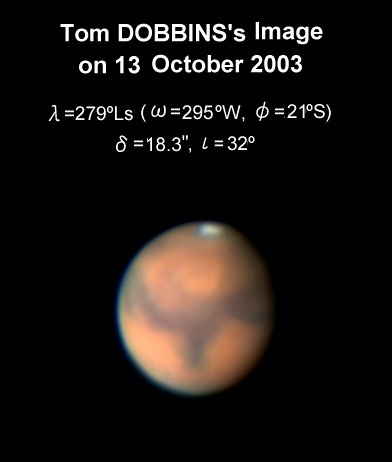 13 October 2003 (λ=279ﾟLs) : 1) At the beginning of October, the apparent diameter of Mars became smaller than the maximal diameter 20.8" in 2001, and hence we should say the period of the long-expected great opposition has ended. 2) As October came in (~271ﾟLs), M Chronium looked slightly more darkened (in a wine colour) and made a boundary of a large faded circumpolar round region (including Thyle I and Thyle II and also Dia). The thawing spc is distinct with a clear perimeter. 3) The phase angle has already been larger than 25 degrees, and the evening limb side now shows us easily more yellowish flying dust haze. Furthermore the water condensates are also thick near the limb (KUMAMORI on 8 Oct and AKUTSU on 9 Oct). They are thick for example over the afternoon Argyre in addition to Chryse-Xanthe. As well the airborne-dusts/water-condensates near the limb easily weaken the dark markings. This must be the same on any hemisphere. Morning low-lying or ground fog is also thick. 4) NB: In 1988, the planet was closest to the Earth when λ=277ﾟLs (with δ=23.8"), with similar surfaces facing toward us and so some comparisons are possible: The circumpolar round faded area to the south of M Chronium was not so evident in 1988. 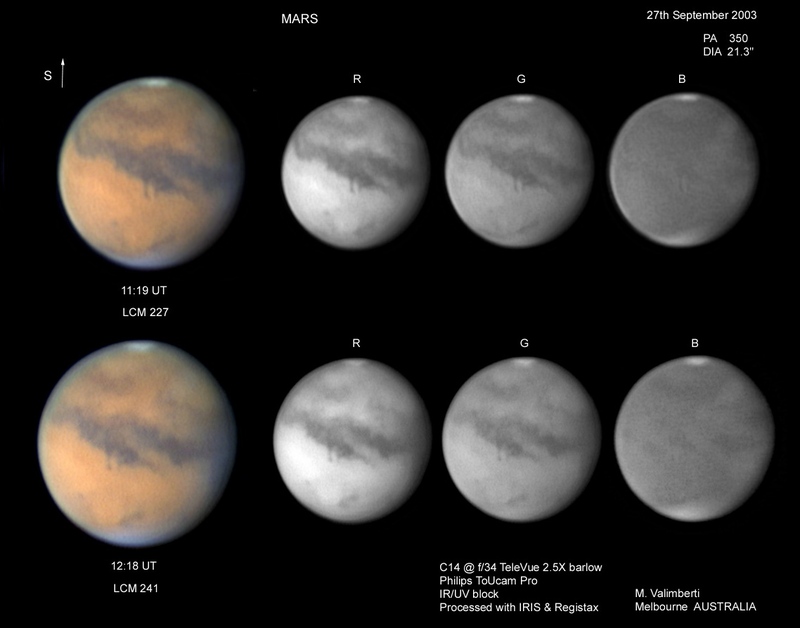 In 1988 at this season ~λ=280ﾟLs, Olympus Mons was marvellously ground-lit, while Arsia Mons was evening whitish cloudy with a roll cloud. 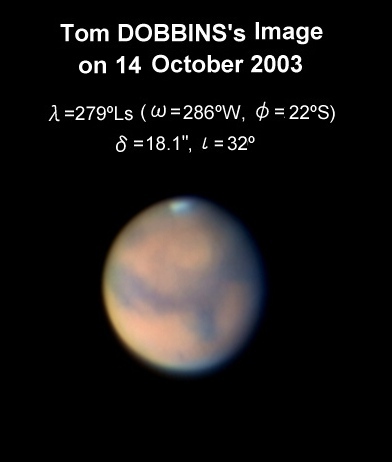 In October 2003 this was not so conspicuous (rather dull reddish), but rather proved bright evident at the opposition period at the end of August this year. The Olympus Mons aureole is therefore a kind of opposition effect. Morning and evening mists were seen also in 1988. In 1971 at this season, the Martian surface was already smeared by a great dust cloud. 5) The planet begins to shine early in the evening in the eastern sky and so it still needs much time to chase the surface a night (about eight hours from 17:30 JST). Henceforth we are sorry we can not yet afford the time to edit and update the CMO bulletin. 30 September 2003 (λ=270ﾟLs) : 1) Final stage of Novus Mons: The detachment and disappearance of Novus Mons noted by Viking were estimated at approximately λ=242ﾟLs and λ=270ﾟLs (P B JAMES et al, JGR (1979) 2889). This year Novus Mons began to protrude from the periphery of the spc around at λ=220ﾟLs, and at around λ=240ﾟLs it showed up as a pretty bright fragment alongside the pier (see an excellent image by M VALIMBERTI on 15 August). From the Orient it was interesting to watch a bright spot of the eastern end of Novus Mons and the preceding remnant from λ=244ﾟLs to λ=246ﾟLs. A final state of Novus Mons was witnessed here on 22 September (λ=266ﾟLs) to 27 September (λ=269ﾟLs), while the seeing condition was not enough. In 1988, we visually traced it until λ=271ﾟLs (12 Sept 1988, δ=23.4"). The Viking also shot a faint remnant at λ=275ﾟLs, and so we expect further report on Novus Mons. 2) We expected, just like the case of Mons Thyles, a collapse of Argenteus Mons downward at around λ=260ﾟLs, but we could not catch it. 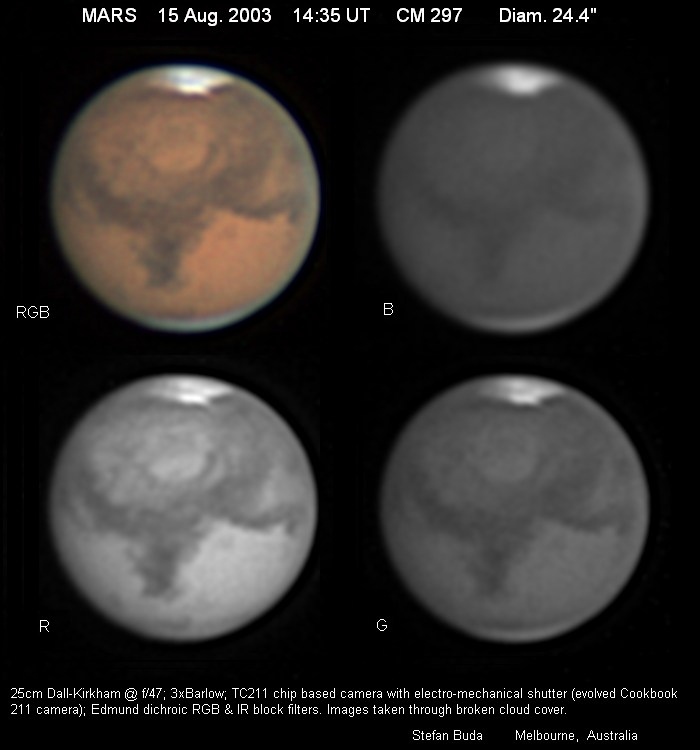 3) The present Martian apparent diameter will soon decrease to be below than the maximal diameter (δ=20.17") of the 2005 apparition. 17 September (λ=262ﾟLs) : 1) The angular diameter from 14 September came less than the maximal diameter in 1988: We thus enjoyed about one month since 10 August the Martian diameter larger than any we experienced in the preceding great apparition in 1988. 2) The spiral structure of the spc due to Rima Angusta seen from the side of Solis L has visually been less explicit to us around at λ=260ﾟLs, while the rift was very explicit in 1988 at around λ=259ﾟLs (see MINAMI's drawing at ω=065ﾟW in Sky Watcher's Handbook, p71, Fig 4.3 (edited by James MUIRDEN, W H Freeman-Spektrum Verlag, 1993). Christophe's images on 15 September (λ=261ﾟLs) however seem to show it. (In 1971, it came to be faintly visible from around λ=247ﾟLs. This year see also Silvia's early images at λ=245ﾟLs, ω=065ﾟW.) 3) Noachis has now come into sight from our side: The widened and darkened M Serpentis at the eastern part of S Sabaeus still actually exists. This is a monument of the furious storm occurred on 4 July, and so it has lasted more than two months. 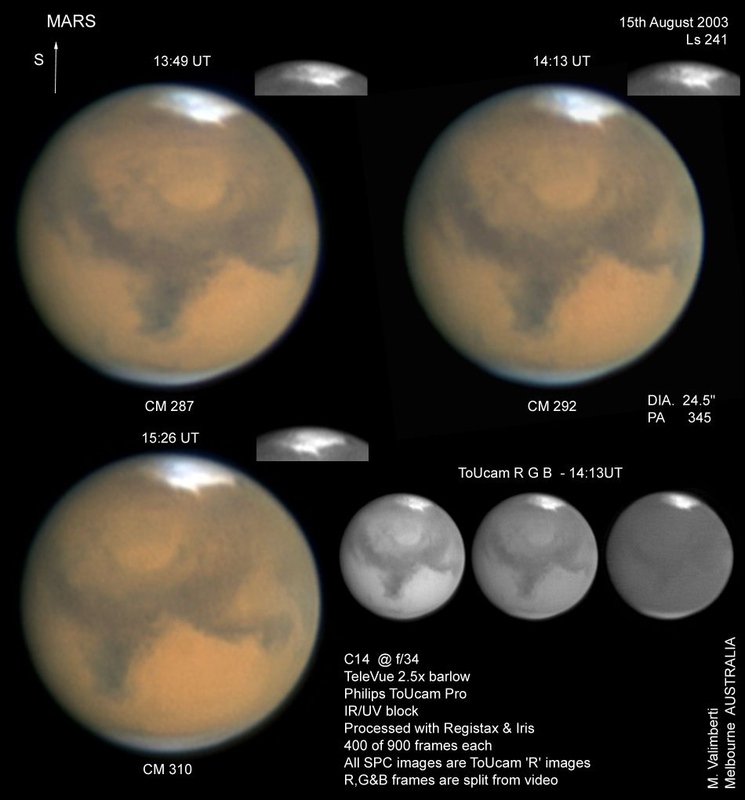 The event mainly caused gradual rise in global opacity by spreading out airborne dust and yielded the present-day exceptionally dirty Mars. 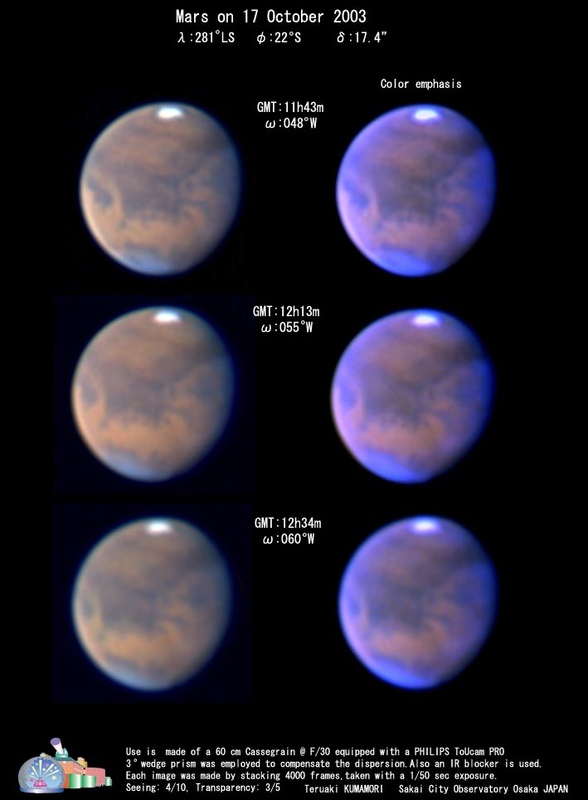 Basically the Martian atmosphere is not clear except when the season is in mid-winter, but at least two dust disturbances in July and August deepened further the optical depth. (It is known the gradual opacity-increase occurs before the onset of a dust storm. Otherwise, the 1971b storm was entrained at λ=260ﾟLs. Viking's second storm 1977b occurred around λ=267ﾟLs -274ﾟLs.) 4) The weather in the Japanese islands recovered since the beginning of September. MINAMI returned home at Fukui from Okinawa on 31 August. 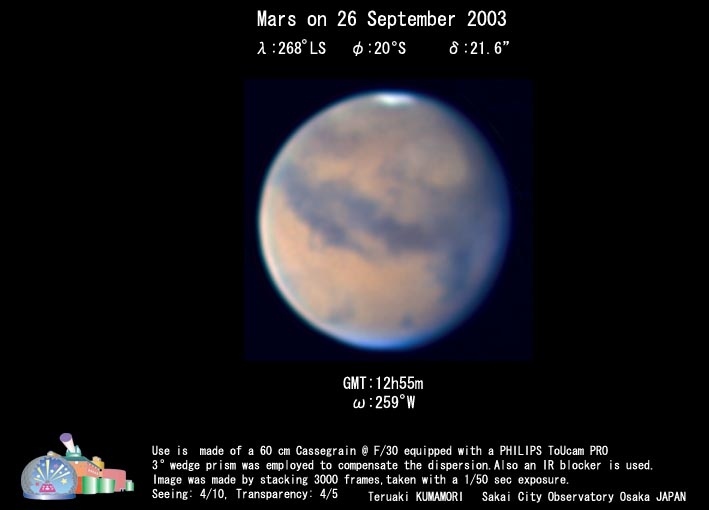 At least at Fukui the planet Mars has ever shined almost every night, and MINAMI enjoys the Mars observation with Takashi NAKAJIMA at the Fukui City Observatory. 09 September (λ=257ﾟLs) : 1) As previously noted, Thyles Mons looked visually as if detached from the spc around from λ=248ﾟLs. Since then it was visible from here (the present writer returned home at Fukui on 31 August from Okinawa) until recently (until λ=256ﾟLs seen from here), and the detached part looked collapsed into a projection accompanied by a triangular faded (whitish?) area. In 1988, the same phenomenon was checked from Japan around from λ=250ﾟLs (10 August 1988) to λ=254ﾟLs, and on 17 August 1988 (λ=254ﾟLs) Isao MIYAZAKI visually detailed the protrusion associated with a faded area by the use of a new 40cm spec (up to 19 August at λ=256ﾟLs). MIYAZAKI this year imaged the protrusion on 30 August (λ=251ﾟLs) and 2 September by the use of the same Newtonian equipped with a ToUcam Pro. The present writer also watched the area by the same telescope on 19,20, 24, 25, and 27 August at the Miyazaki Observatory. 2) The higher latitude dark region (Mare Australe) looks now more faded than before. Otherwise any dark marking is obscure and not conspicuous if not surrounded by a brighter area, and hence this great Mars created no sensation among the public. Simple minded persons say the disk is just yellowish. We should say it is quite a dirty Mars with faint markings. 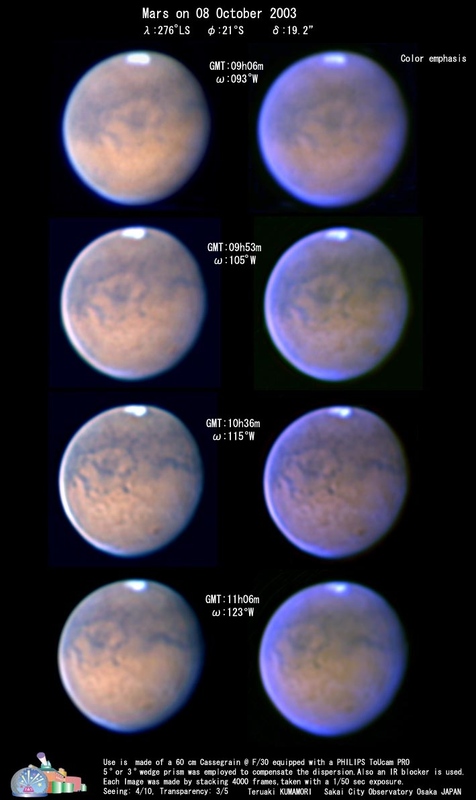 Any ccd imager should stop processing excessively, and any visual observer should check the intensity estimates and colour nuances beneath the global condensate/airborne-dust haze. 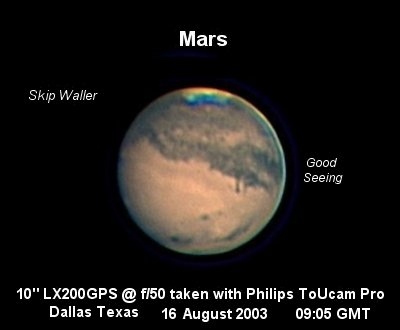 28 August (λ=250ﾟLs) : The planet Mars begins now going away. 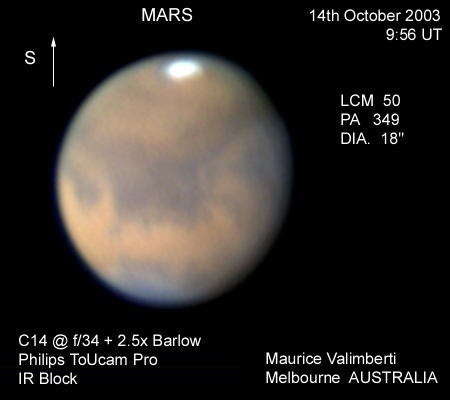 The surface of the biggest Mars yesterday was however not clear enough; finer details were caught because of the big angular diameter (we are watching the area of M Cimmerium), but, as was expected, the markings were shown only in a few gradations. 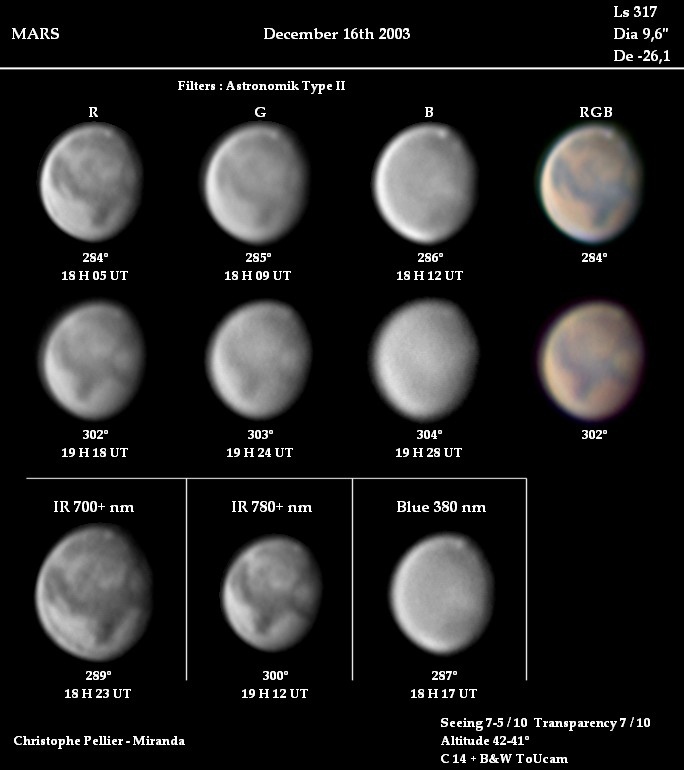 This week the sky has also been clear here at Okinawa, and an Ortho-4mm eyepiece with the famous 40cm f6 Newtonian (courtesy of Isao MIYAZAKI) gives easily the presence of Phobos or/and Deimos, while it does not go the same; that is, it does not give us a good contrasty Martian surface though the fine details are complete. We are so to choose an Or-5mm eyepiece to have a moderate contrast. With the routine telescope 25cm f8.5 Newtonian, the Or-4 mm or XP-3.8 mm eyepiece gave us good images until mid-August, while now we are being forced to stop down to an Or-5 mm eyepiece. Otherwise, the dark ruddy tint seen around the high-latitude markings before looks to have been much decoloured recently. Water condensates are still active, and it seems probable that the southern continents continue to send the air-borne dust into the atmosphere. By the way, Thyles Mons looks visually to have been detached from the spc. 27 August (λ=249ﾟLs) : Click here for the latest image by HST. 25 August (λ=248ﾟLs) : 1) While it has been supposed that the southern high-latitude area on the morning terminator must be thickly frosted or ground fogged, it turns out so often because the phase angle much decreased since around 20 August (ι=9ﾟ). The morning mist to the north of the area looks also thicker mostly because the phase angle decreased. 2) The spc from the side of Solis L should begin now to be described as composing of two comma-shaped bright parts, the Argenteus Mons part and the Hypernotius Mons part (centre of the deviated spc), separated by Rima Angusta. 18 August (λ=243ﾟLs) : 1) We should say the centre of the spc has already moved out to the direction of 030ﾟW. On 7 August (λ=236ﾟLs), Elisabeth SIEGEL from Denmark informed us of her observation at ω=158ﾟW (at 0:10 GMT before the arrival of #5) that the following 1/4 of the spc was much more shadowed than the previous case on 5 August (λ=235ﾟLs). See also Silvia KOWOLLIK's sequence on 7 August from ω=137ﾟW to 166ﾟW. Christophe PELLIER's excellent images on 9 August (λ=237ﾟLs) and on 11 August (λ=239ﾟLs) are also interesting. On the opposite side, Maurice VALIMBERTI and Stefan BUDA gave superb images from the angle around about ω=300ﾟW on 15 August (λ=242ﾟLs) where the preceding part of the spc appears to have fast melted. Today (18 August: λ=243ﾟLs) yet the remnant is visible since the original boundary (dark fringe) still exists, while the melted part has an intensity similar to the outskirt (observed from Okinawa around at ω=290ﾟW). Note that this tendency began already around λ=230ﾟLs (see below the Note on 27 July). Simply thinking, the depth of the spc should be shallower if seen from the angle around ω=210ﾟW: See Skip WALLER's image secured at Texas on 16 August (λ=242ﾟLs) at ω=208ﾟW. 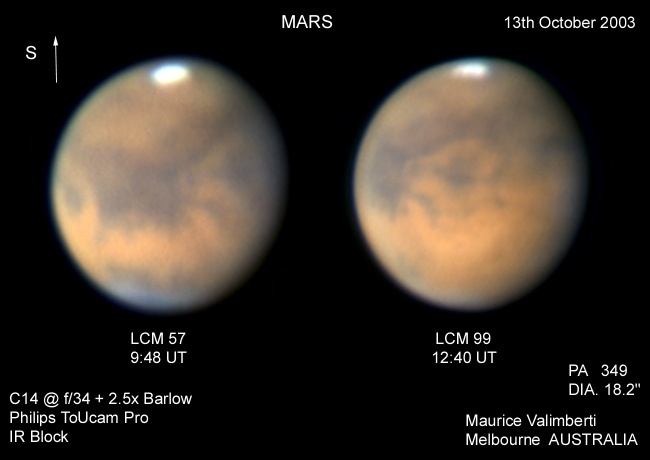 2) The observers on the Japanese mainland still complain about the weather: the rainy season ended officially at the beginning of August, but they have been endowed only with a few preferable nights to observe Mars until now, and hence the Gallery also shows only a few images from the Japanese angles. They say this summer must be a "cold"-summer in Japan (Okinawa is different however), while we hear often "hot" news from Europe. They expect however the weather turns better from the end of this week. 3) The Japanese side surface has been however watched from Okinawa. Mars is still a Yellow Planet, and the surface details and the gradation of the markings are apparently poorer than the case in 1988. If the atmosphere remains the same, the surface will become much obscurer once the angular diameter rapidly decreases after opposition. 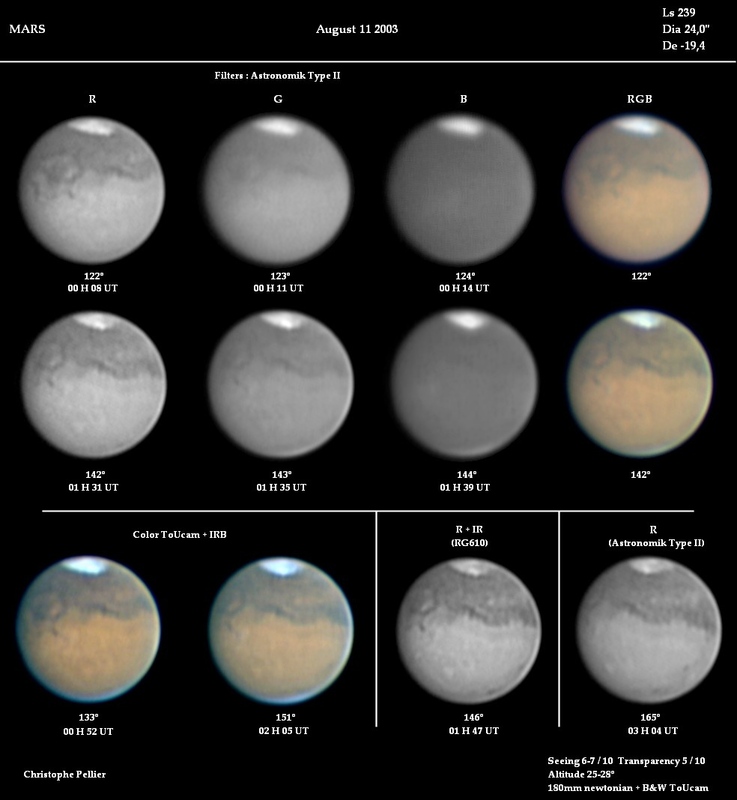 At present the meteorology looks normal since the fact that Arsia Mons is roll-clouded in the afternoon while Olympus Mons is free from the orographic cloud (but just glints in the Sun) is the usual pattern also observed slightly later in 1988. This trend was observed in 1990 at least until λ=315ﾟLs. 7 August at 01:10 GMT (λ=236ﾟLs) : CMO 2003 News #5 on the "Deviation of the centre of the spc from the south pole" was issued by email. See Director's Report #5. 4 August (λ=235ﾟLs) : The distribution of the dust core at Eos to Protei R remains unchanged so much from 2 August to 4 August. The brightness of the core (originally, cudgel-like) is weaker than the sun-glint Ophir or Claritas. However the large area is quite dusty and influenced also the upper yellow haze. The density of the yellow haze/water condensate looks to have increased, and the surface has become much opaque. On the other hand, since the apparent diameter has much grown up, such a minor marking as Iuventae F is always visible and the boundary dimensions of markings are easily captured. From this side the spc is still stout and active. 1 August (λ=233ﾟLs) : The dust cloud in Chryse observed by Ed GRAFTON and others on 30 July (λ=231ﾟLs) was observed in the Martian evening from Japan (KUMAMORI et al). On 31 July, it was rather silent except at Eos (VALIMBERTI and others), but on 1 August it has grown larger seen from Japan (ISHADOH et al): Its west was however bounded by Aurorae S and its southern edge was along M Erythraeum. The area of Eos was brighter. Margaritifer S looked faded inside the dust pond.